In the “Blackpowder Substitute” realm, use Blackhorn 209. 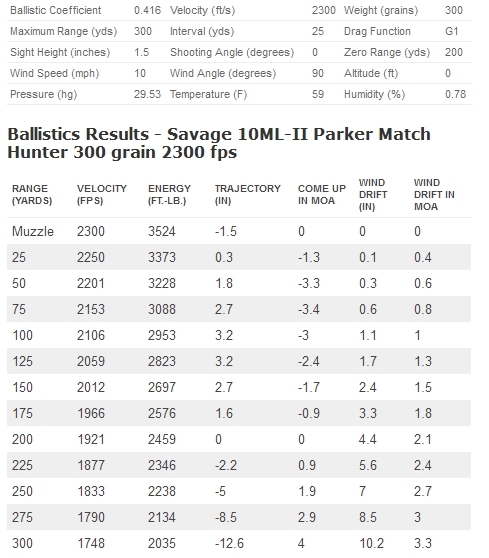 The longest range load is the 300 grain Parker Match Hunter 300 grain pushed by Alliant Reloder 7. For 200 yards and in, or for low recoil, use Accurate 5744 and 300 grain Parker Ballistic Extremes. You'll get the most reliable ignition with Reloder 7 and Blackhorn 209 by using my though-hardened ventliners: http://randywakeman.com/savage0.htm . Representative exterior ballistics with 67 grains Reloder 7 and the 300 grain Parker Match Hunter are shown below.